This petition causes no small amount of distress to self-identified Protestants and Evangelicals the world over. I hope I’ve already demonstrated that Roman Catholics are not engaged in worshiping the saints when they ask them for prayer, so that particular issue won’t be in view here. 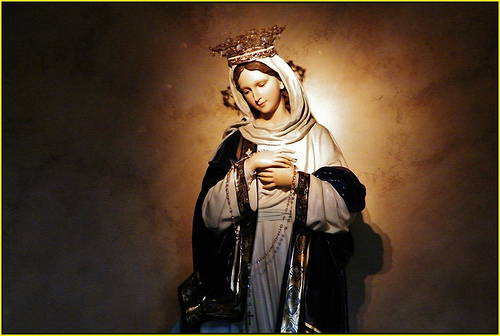 However, Marian devotion can still be confusing to those of us that have backgrounds in the free churches or conservative Evangelical traditions. What’s up with making such a big deal out of Mary? Have Roman Catholics elevated her to the status of (a) God? What do Roman Catholics think about the role of Mary in salvation? First it’s important to establish that in Roman Catholic theology, Mary truly is of secondary importance when it comes to basic Gospel message. However, just like the nation of Israel, Mary has a special place in God’s plan to save the world through Jesus, and thus worthy of special honor. After all, Mary’s devotion and humble obedience to the Father meant that she carried the Incarnate Word in her womb. In her humility, she continually directed praise and worship back to the Father and her son, Jesus. Nevertheless the Scripture also records that she and others knew that all generations would call her blessed (Luke 1:46-48). Evangelicals have at least something to learn here. Although many of us will disagree with the degree to which Roman Catholics honor Mary, if we only remember and honor her once a year (for a few days around Christmas) are we really being faithful to Scriptures? I think we have often over-reacted in our attempt to correct perceived excesses from our Roman Catholic brothers and sisters. As previously stated, I’ve already addressed prayer to saints, but many Evangelicals take note that for Roman Catholics, there’s a special emphasis on asking Mary for her prayers. Why? Not because she some sort of superhuman or divine being, but because her special maternal relationship with Jesus has implications for us also. If we are indeed united to Christ in a special way as believers (and for Roman Catholics, through the Church and the Sacraments) then Mary becomes a “spiritual mother” for us also. So among all the saints, there is a unique relationship between those Jesus calls a “friend and a brother” and his mother (John 19:26; John 15:15; Hebrews 2:11). For Roman Catholics, this is expressed (with all the saints in heaven) as a ministry of intercession for those Jesus loves. As an intercessor and the one who freely chose to bear Jesus, she is a source of grace (gifts), however this grace is understood to be ultimately from God the Father through Jesus the son. Because of Mary’s special role in the plan of salvation and because of her ministry of intercession, some in the Roman Catholic Church have given Mary titles like “Mediatrix” (Mediator) or even “Coredemptress.” These kinds of words sound especially bad to us Evangelicals (they definitely rub me the wrong way)–after all, isn’t there only one mediator between God and man for salvation (1 Timothy 2:5-6)? To this Roman Catholic teachers and theologians give a resounding, “YES!” Yet God does use other human beings daily to show us his grace, love, mercy, and to pray for us. These are mediated experiences. Although Jesus is the One High Priest, the Bible also states that every Christian now has a priestly, intercessory role–God graciously allows us to share in the work of Christ (1 Peter 2:9). Only in this sense does Mary “mediate” between us and God.